"The passing at 80 of Dave Mackay, one of my great heroes, left me feeling distraught, yet relieved that he was at last free from the fog of dementia in which he had been lost for several months. Those of us close to the Mighty Mackay knew that he was in trouble with both Alzheimer�s and Parkinson�s, but he battled with typical lionhearted courage. There has been no greater football warrior in my near-70 years following the Beautiful Game. I wondered how best I could pay fitting tribute to the Braveheart who scorched across pitches for Hearts, Tottenham, Derby, Swindon and Scotland, and I dug out a Q&A feature Jimmy and I produced when we were in harness for The Sun back in the 1970s after Dave had followed Brian Clough as Derby manager." Did you always want to be a footballer? Not just a footballer, a Hearts footballer. They have always been my favourite club. When I was just a kid I used to walk three miles there and three miles back to get to watch them play at Tynecastle, and I was so small I could nip under the turnstile and get in without paying. My one dream was to play in the maroon and white shirt. You�re the most competitive bloke I�ve ever known. Were you like that at Hearts? As you know, whether I�m playing football, golf or tiddlywinks, I HAVE to win. I used to be the smallest player on the pitch and to win the ball I had to tackle twice as hard as anybody else and I never got out of the habit. Even now I�m retired my players fear me in six-a-side kickabouts, because I only know one way to play and that is to win. My two brothers also played for Hearts, and the three of us had a reputation for being ultra competitive. Fitba�s a man�s game. Yes, you used to kick lumps out of us in the Tottenham gym. But you were about much more than power and strength, Dave. I like to think I could be as accurate with my left foot as the great Danny Blanchflower was with his right. I made a few goals for you Jim with my passes. I was lucky to play for a Hearts team that put the emphasis on skill and then joined a Tottenham side that played pure football, because that was the way manager Bill Nicholson wanted it. Anybody thumping the ball without thought got a right mouthful. Which was the greatest team you played for? Well obviously the Tottenham team that won the Double in �61, but the Hearts side with which we won the Scottish championship ran them close. I skippered the team that banged in a British record 132 League goals that season. Even you, Jim, didn�t rattle in that many! You made our Spurs side even better when you signed from Milan, and we deserved to be European champions in your first season but were robbed in the semi-final against Benfica by some diabolical refereeing decisions. How difficult was it combining National Service in the Army with your football? I got off lightly. There was no war to worry about and I had a sergeant major in the Royal Engineers who was a football nut. He used to make sure I got home every weekend to play for Hearts, provided I got him a ticket. I also played for my regiment in midweek and was as fit as a fiddle. I did more running about on the pitch than square bashing. You won only 22 Scotland caps when players with half your ability got picked many more times. Why was that? I played in the days when the selectors considered you something of a traitor for taking the English pound. A lot of Anglos were often ignored. I was always proud to play for Scotland, and if you mention the 9-3 game Jim this interview is over. That still hurts to this day. It was a freak result and is the only game people seem to remember me playing at Wembley. The worst thing for all of us in those 1960s was losing dear John White. Yes, I still well up when I think of it. He had asked Cliffie Jones and me to play golf with him but we turned him down because there was a lot of rain around. He went out on his own and got hit by lightning. It was a tragedy that affected everybody at the club, particularly his best mate Jonesie and me. I had been responsible for him joining Spurs, because I�d played with him for Scotland and told Bill Nick that he had to sign him. He was a magnificent footballer, a real players� player who always put the team first. Breaking your leg twice and then coming back to lead Tottenham to the 1967 FA Cup earned you the nickname of the Miracle Man. Well it was something of a miracle really when you think of the mess my leg was in when Noel Cantwell did me at Old Trafford. I�m not going over old ground, but you saw it Jim � one of the nastiest tackles ever! Then I got it broken again in a reserve match and for a while it looked as if it was curtains. But I was determined to play again, and that was a marvellous Spurs team I captained at Wembley. You and Gilly (Alan Gilzean) were two of the best striking partners I ever saw. Poetry in motion. Remember that game when the ref sent you off and you talked him out of it? For all my reputation for being a tough guy, I was never ever sent off and I was not going to let the referee spoil my record when I knew he was making a mistake. It was in a Cup tie against Bristol City and that little so-and-so Johnny Quigley kicked me up in the air. All the ref saw was my retaliation and he said. �Off Mackay.� I grabbed hold of Johnny and marched him to the ref and he was honest enough � or scared enough � to tell the ref what had happened, and he let me off. It started off as me showing off, but then it became something of a superstition, and I also did it to let the opposition know I had a bit of skill. A lot of people thought I was all about tackling. But I could play a bit. You will confirm, Jim, that I could beat all of you at keepy-uppy and I can still lob a two bob bit into my top pocket. There�s that famous picture of you grabbing Billy Bremner by the scruff of the neck that proves your competitive nature. I hate that bloody picture. It shows me in a terrible light. People see that and think what a bully I must have been. But I was just putting young Billy in his place. I had not long come back after breaking my leg a second time and he jumped in with a reckless tackle. He and I have always been big mates and roomed together on Scotland trips. That was just a moment when I felt I needed to give him a bit of fatherly advice about watching his tackles. We often laugh about it. When you at last won the Footballer of the Year award in 1969 you had to share it with Man City�s Tony Book. Did that spoil it for you? No, I was just proud to have won even if it was a joint award. Tony Book is a smashing bloke and he had an outstanding season. I would have been choked if I had gone through my career without getting the award because I never had false modesty and knew I deserved it. The fact that you never got it Jim is a joke. I was shocked when you signed for Derby, because you told me you were going home to Scotland. That was the plan. I was all lined up to go back to Hearts as player-manager when I got a call from Brian Clough. He locked me in Bill Nicholson�s office and said he was not going to let me out until I�d signed for Derby. He is the most persuasive guy I�ve ever met and he convinced me I could still play at top level. You changed your style completely when you moved to Derby. Cloughie knew my legs had gone and told me just to use my positional sense and guide young Roy McFarland at the heart of the defence. Brian wanted me for my leadership qualities and I slotted in comfortably, more as a conductor than the old-style competitor. Others did the running for me and I just kept motivating them with the odd tackle and a flourished fist. I think opponents were frightened of my reputation, not realizing that I was nothing like the player I�d been at Tottenham. But it all worked very well and I was nicely paid. Now you�ve taken over from Cloughie as Derby manager and have won the League championship. Do you remain a Cloughie fan? Of course, he is a master and I�ve been lucky to play under three of the greatest managers ever in Tommy Walker at Hearts, Bill Nick and then Cloughie. I have learned so much from the three of them. They are completely different personalities but have the same fundamental belief that football is a game of skill. The principles I hold are the same as when I first started out with that wonderful Hearts side. What was the best advice you got from Cloughie as a manager? That I should burn his desk! That�s what he did to Don Revie�s desk when he took over at Leeds, and when he came here to do some transfer business he said I should set fire to his desk because it gets rid of the stench of the old regime. With a gun to your head, who would you say was the most important influence on your career? Without question, my wife Isobel. She is the perfect football wife. Knows when to encourage and when to shut up. Without her, I would not have been half the player or half the manager. She is my strength and I�m not saying this only so she�ll let me off the shopping tomorrow so I can play golf. I�d have loved to have been a golf professional. Now there�s a life, almost as good as being a footballer. That interview from nearly 40 years ago gives the perfect insight to Dave Mackay the football man. He was a hero for all seasons. 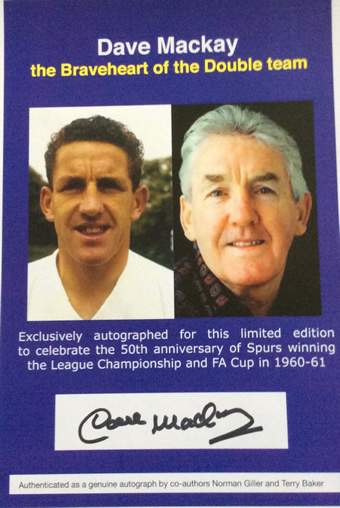 Dave Mackay signed dozens of autographs for a book I wrote on the Double year. The books have sold out but there are many autographs left, among the last that Dave provided before the Alzheimer�s took a grip. I will send you one of his signatures as photographed here in return for you making a donation of any amount in Dave's memory to the Tottenham Tribute Trust https://www.justgiving.com/thettt All monies go towards helping out old heroes who have hit difficult times. Come on, let's see what we can raise in the name of the Great Mackay. I will get in touch with anybody who donates. If making a donation, please add a message about Dave and mention Norman Giller so I can detect whom to contact. There is certain to be a sea of sentiment and sadness as the Lane supporters pay their tribute to our great hero before the Swansea match this evening. We are saying a fond and final farewell to the Great Mackay.